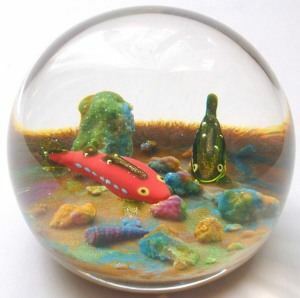 The paperweights of Paul Ysart, from their initiation through to the present day, have been met with an enthusiasm only equalled by that of the artist in creating them. These weights of such consistent high quality craftsmanship must, at least in part, owe their success to Paul Ysart’s obvious delight, innovation and devotion within this field of glass. In exploring the techniques and designs of the nineteenth century paperweight makers, rather than create technically perfect but artistically stale reproductions, his modern paperweights have revitalised and even redefined aspects of the craft. Pablo Ysart was born in June 1904, the eldest son of Enriquetta and Salvador Ysart of Barcelona, Spain. He was to follow the family craft of glass-blowing which was by no means a long standing tradition as one might assume. The earliest family link with the glass industry seems to be provided by Salvador’s mother who was involved in a glass-house not as a glass-blower but in the finishing processes. But the vital Ysart connection began with Salvador defying the wishes of his father (who was a barber by profession). Salvador was nine years old when he began a job in a bakery, each day he came home clean and tidy from work however one day he returned dirty and tired. His father, shocked by his son’s appearance, asked for an explanation and young Salvador had to confess that he had left the bakery to work in a glass-house. His father warned, “The day you leave the glass works I’ll break your nose!”. So glass-blowing became Salvador's vocation and fortunately his nose remained unbroken. In 1909 Salvador uprooted the family (the sons, Paul, Augustine and Vincent) taking them to France to work in the thriving glass industry there. The Spanish Glass Industry was bound by tradition; in the 15th century it was regarded as rivalling Murano, giving little scope for individual expression. The growth of art glass based around Nancy in France attracted young glassblowers from all over Europe eager to be involved in the exciting new movement in glass making. Initially he found employment in Marseilles then Lyons, where Antoine was born in 1911, and finally in France, they lived at Choisy-le-Roi, Paris while Salvador worked for Schneider Fréres et Wolf at Epinay-sur-Seine, Paris. On September 15th, 1915, the Ysart family emigrated to Britain to take up employment in the Scottish glass industry which had a great demand for technical expertise due to the loss of skilled workers during the Great War. Salvador joined the work force of the Edinburgh and Leith Flint Glassworks, which had been forced to abandon normal cut-crystal production to specialise in the production of industrial and scientific glassware, under the direction of the War Office. Salvador worked as a senior glass-blower, teaching the technical aspects of the craft, and Paul as an apprentice. As all apprentices, he began by carrying blown pieces to the lehrs(2) and assisting the glass-blowers. So Paul Ysart’s first experience of glass was in a technical rather than creative context. In 1916 the Ysart family moved to Glasgow where Salvador and Paul worked for A & R Cochran of Glasgow, little is known about their short time there, but with the business facing serious financial problems after the War, they eventually left for employment in Perth. In 1922 they joined John Moncrieff’s glass-works where by 1924 Monart decorative glass was being produced on a commercial basis. Paul Ysart remained there until 1963. During this initial period Paul gained a thorough knowledge of glass-making in an environment which allowed the development of his creative faculties as well as his technical expertise; he was able to experiment extensively with colour and decorative forms for the first time. The Moncrieff works used a wide range of glass colours supplied by ‘Gilbert Martin’ of Paris which Paul visited to choose and collect material such as ‘goldstone’ glass, or ‘aventurine’, which created the vivid gold flecks frequently seen in his paperweights as well as Monart pieces. His father obviously provided him with much of the knowledge upon which he built with great experiment and exploration of the material. Salvador used millefiori in an experimental cup made in 1922(3) and filigree canes in an early bowl, techniques later to be found in Vasart glass and, in a more sophisticated form, the paperweights of Paul Ysart. It is obviously difficult to trace the exact date of Paul’s first paperweights and it would seem most probable that they were executed initially as experimental practice pieces: a paperweight can encompass a multitude of complex techniques and effects. 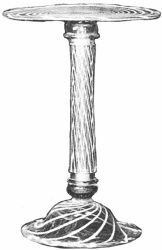 Many early weights would have been made as personalised presents for friends and relatives, just as glass-blowers had done in the nineteenth century, giving delight through novelty rather than pure technical virtuosity. However a large and rough paperweight has been dated by Paul as being made as early as 1932. Paul developed his artistry as a creative and wholly personal outlet, an individual project free from the constraints of the commercial, artistic or technical direction of others, which proved to be the cause of conflict with his father. Salvador’s assertive nature(4), which had decided the family’s move to Scotland, and volatile temper was a constant aspect of life in the Moncrieff factory. In 1935 the Ysarts made a table in clear and white glass(5) intended as a gift to be presented by the Perth Museum to the Royal family. The Perth Accepting Committee rejected the offering due to its great fragility and Salvador, in anger, destroyed many days painstaking work by smashing the table into pieces. Strong-headed and self-determined himself, Paul insisted on pursuing his craft with enthusiasm and vigour. He remembers, with pride and fondness, one early experiment he made with materials. He found pipe-clay to be compatible when used in glass weights. Realising the potential of this idea he identified a company producing clay smoking pipes and leapt on his motor-bike to Glasgow to fetch a batch of materials to use in castings, from which he made a beautiful cast-swan paperweight. This spontaneous trip to Glasgow was the result, according to Salvador, of a ‘silly kid’ experimenting which he regarded as flippant and time wasting. However, his ‘clay-pipe’ venture did not finish there; he contacted a ceramics factory in Etruria to buy coloured glazes with which to decorate the castings. Paul even looked to the local ‘Woolworth’s’ store for inspiration, for example, buying a cheap mock cameo brooch from which to take a casting. He also continued to develop his traditional glass skills: lampwork; filigree; latticino; millefiori. He accumulated a stock of samples, for his own reference, of his cane designs. These consisted of segments of millefiori cane, half an inch in diameter, of varying (often astonishing) intricacy and each magnified by the application of a small layer of transparent glass. His lampwork was his vital and most stylistically recognisable skill from the early years of his career in glass. Perfecting a detailed lampwork flower or dragonfly, combating the incompatibility of the various coloured glasses, Paul might momentarily turn his concentration to a more directly rewarding task, making delicate neck-laces and bracelets of coloured glass linked chains for the children to play with. Paul seems to have sustained his refreshing, even quirky, humorous approach towards the craft, for example, pink and white candy-stripe winged ducks with red conical beaks and serpents with distinctly wistful expressions. Perhaps this is due to his motivation of discovery, to take a concept or technique and fully explore its potential, allowing himself the time-consuming pleasure of deviation and ensuring a constant supply of inspired ideas. The Ysart men, Salvador, Paul, Augustine, Vincent and Antoine worked together producing Monart Ware and scientific glassware until the onset of the Second World War when the glass works were given over solely to the production of laboratory and medical precision instruments. Sadly, the youngest of the sons, Antoine, died in a road accident in 1944. In September 1946 Salvador, Vincent, and Augustine left the Moncrieff works to start their own company at Shore Works in Perth which began as the Ysart Brothers’ Glass. Paul remained at the Moncrieff works where he continued to make Monart decorative glass and paperweights; some of his most notable three-dimensional lamp-work paperweights featuring lizards and serpents were developed then. Detached from the rest of his family as a glass-blowing team, Paul was able to place a greater emphasis upon his own work and this is reflected in the quality and variety of the weights produced. By 1938 his paperweights were being included in important collections and were acknowledged as some of the finest examples of the craft since the mid-nineteenth century. He was making paperweights in traditional millefiori patterns and using filigree and latticino canes equal in intricacy to those of classic French weights often placed on or sunk into a variety of grounds. His lampwork frequently incorporated millefiori either as a surround or as the centre of a flower or the wings of a dragonfly, for example. Around 1955 Paul Ysart came into contact with Paul Jokelson, President of the American based ‘Paperweight Collectors Association’, who began to export Ysart’s paperweights to a keen American market. This business relationship was maintained throughout Paul’s active career in the glass industry. Indeed this connection with the United States partly accounts for the lack of collections open to the public in Britain and the higher value attached to pieces here. Paul Ysart was invited to attend the ‘Paperweight Collectors Association Conventions’, in varying capacities as a respected craftsman, where he met his friend and contemporary Charles Kaziun. They shared similarities in their exploration of traditional paperweight techniques and their application to the modern weight and found each other’s work to be inspirational. Paul particularly admired the Millville ‘Jersey Rose’(6) weights made by Kaziun and commented that Charles was not interested in making ‘snakes and lizards and such things’. 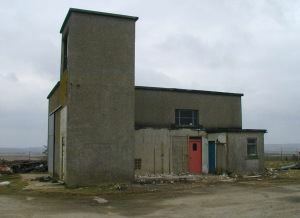 The building at Harland, Wick where Paul had his studio. In 1963 Paul left Moncrieff’s to join Caithness Glass Ltd. where he took up the post of Trainee Officer, hiring and training apprentice glassworkers. Paperweights remained his priority, and he continued to produce a range of twenty different types, using the facilities of his private studio for seven years, whilst Caithness produced modern pieces under the supervision of Colin Terris. During this period Paul also became involved in the design of a range of ‘fashionable’ jewellery using millefiori canes. Upon leaving Caithness in 1970 he formed his own company in Wick called ‘Paul Ysart Glass’ which was producing paperweights until 1979. His association with Paul Jokelson and the American market continued, as did his attendance at the Paperweight Collectors Association convention, the last that he visited being in Deerborn, U.S.A. It was the defiance of his father’s wishes which had led Salvador to begin work within glass and later Paul’s defiance which led him to branch out and create such innovative glass. A perfectionist within his art, Paul Ysart succeeded in forging a link between the traditional and contemporary paperweight. In discussing the paperweights of Paul Ysart the historical and cultural context should be taken into account; his work, its impact and its collectors illustrate the processes of redefinition involved in discussing the art and craft practice. In the nineteenth century, paperweights were produced by the glassworkers more as a ‘side-line’ after factory hours to provide a supplement to their basic wage than an expressive ‘art’ within itself. They were sold as relatively inexpensive decorative gifts and novelties in emporiums and bazaars. Utilising the same traditional techniques, Ysart paperweights have from their inception been viewed in terms of ‘Art’ and are therefore more likely to be seen in a specialist shop or gallery, being created as ‘hand-made original limited editions’ for a collector’s market. Despite the complexities in defining ‘Artist’ or ‘Craftsperson’, within the context of production and consumption, it is perhaps possible to use one point of differentiation. Paul does not only show great technical ability within his medium, he reveals a love, enthusiasm and sympathy for it and this is surely the vital point when terming him as an ‘Artist’. Howe Cottage: Where Paul Ysart lived during his days in Wick. Paul Ysart’s sensitive observation and vitality were illustrated in his recounting, at the age of eighty-three, of a strange and fascinating experience. From his holiday in Dubai, during 1976, with his daughter Adele and her husband Lou, Paul has one vivid memory in particular. Each day he would visit a nearby stream where a large, beautiful and brightly coloured dragonfly would settle. After some days of patient attention, the dragonfly gradually became accustomed to Paul‘s presence and would allow him to gently stroke its body. from Enchanting Paperweights Signed “P.Y.”, by Fred A. Nagel. Journal of American ‘Paperweight Collectors Association’, 1968. Lehr: A lehr is a type of large kiln which is used to allow the glass to cool gradually, removing stress points arising during the forming process of the glass (a process called annealing). The cup and bowl are in the Perth Museum. “He was all for wanting to travel”, says Paul in explaining the reasons for leaving Spain. Photograph in British Glass Between the Wars, Dudley Leisure Services. 1987. p.12. The Millville, or Jersey, Rose is a type of paperweight made first in about 1905. It is a full rose in a footed orb, Charles Kaziun, born 1918, created his own variation that is now known as the ‘Kaziun Rose’. This article was based on an interview with Paul Ysart and his son-in-law in the Autumn of 1987, that was based on the bulk of material supplied by many of the club members. Much of the previously published material contained many contradictions and inaccuracies. There are still many questions to be asked, some of which will hopefully be answered by the forthcoming book. Alison Clarke is not a collector herself. Her interest in Paul Ysart originated while studying a History of Design degree at Manchester Polytechnic where she made paperweights herself during the practical element of the course. After lecturing at Stourbridge College of Art, she now (2002) lectures at the Royal College of Art and is a Visiting Professor, Design History and Theory at Vienna University of Applied Arts.